More and more Chinese minors who are "ruled by beauty" are seeking cosmetic surgery for non-medical reasons and doctors are warning about the trend. Doctors say that cosmetic surgery requires psychological maturity and minors should be wary of cosmetic surgery as they may become end up physically and mentally "disfigured". Medical staff were confused - and when they checked the patient's medical records they found the girl's ID card copy showed her as 22-year-old - and therefore an adult. However, a hospital review found the girl was actually a high school student, who get that her face was chubby and therefore got the idea of having cosmetic surgery. For this reason, she deliberately made herself a fake ID on which she changed her age, and ultimately was successful in obtaining cosmetic of surgery. 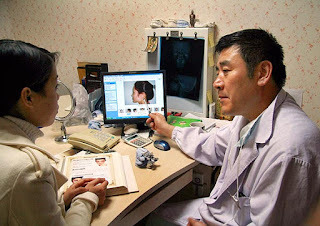 In response to this, the Liaoning Provincial People's Hospital, director of the Plastic and Reconstructive Surgery Dr Long Yuanji said there were no circumstances in which minors could be allowed to have non-medical cosmetic plastic surgery, and therefore the hospital requires that any young people who seek surgery must be accompanied by parents and signed agree to surgery. Chinese media reporters have found that the demand for cosmetic surgery gradually increased towards the end of the year the, most of it for girls. There were three main groups of High School, Middle School, and Art School candidates who sought surgery as preparation for college entrance admission. The main categories of surgery favoured by minors were double-fold eyelids, nose jobs, bone lengthening and liposuction f.
Dr Long said cosmetic surgery was increasingly sought by minors but it requires not only physical maturity, but also there needs to be psychologically maturity as patients need to be fully prepared to face a series of unknown surgical risks. Many minors are psychology not fully mature but blindly follow the trend. However, their ability to tolerate it is limited and if surgery 'fails', it inflicts a huge psychological blow. Often after cosmetic surgery there is a gap between expectation and results, he says. He cites rhinoplasty surgery as an example, as it is, sometimes difficult to achieve satisfactory results with the nose. Dr Long urges parents and minors not to let plastic surgery lead them into being disfigured.